Home Faith How Is This Possible? I’ve now read through the Gospels 84 months in a row. I mention that so you’ll realize how easy it is to repeatedly hear or see something without hearing or seeing it. Last week I noticed something I had missed in the previous 83 readings. Early on in my monthly readings I decided to find every place Jesus, either explicitly or implicitly, mentioned his death or resurrection. Over the years I counted 28. And then last week I found a 29th. Of the 29 nine recorded instances where Jesus mentioned his death or resurrection, how many do you think the disciples understood? Amazingly, not one. I can’t help but wonder how this is possible. Certainly Jesus spoke of his death or resurrection more times than those mentioned in the gospels. The Lord’s enemies understood his words. They feared the disciples would steal his body and say Jesus had been raised from the dead. And what of the disciples? They never believed he would die. And if he wouldn’t die, any comment about him being raised from the dead fell on deaf ears. I suspect they concluded an eternal kingdom required an eternal King. Once they had that biblical bias, they rejected anything that contradicted it. I wonder how often I do this. For years I believed God no longer spoke to people today or healed–except rarely–and freed people from evil spirits. I was so convinced of my view that that I never investigated another possibility. Until the day God invaded my life and healed a young woman named, Lisa, in Baton Rouge, Louisiana. After that miracle, I realized I had missed something important about Jesus. That’s around the time I decided to read the Gospels every month for the rest of my life. And now I saw something I had missed time and again. How’s that possible? 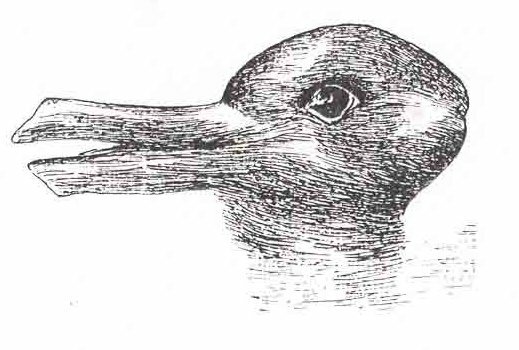 About the picture: Do you see a rabbit or a duck?